Can We Innoculate Against The Mean Girl Syndrome? As sad as it is, I believe this phenomenon comes from a positive place: the drive, the need for relationship and connection. We are all born with it (aren’t we?). But somehow, with little girls (disclaimer: I can’t speak about boys, so I won’t. I have taught all girls for 35 years now), the drive is so strong that children create an entire social system to meet the need. Without adult support, this system, created by young children, can only be based on what a young child creates. Often, it seems, that system does not tap the potential for the compassion, caring, inclusion, and love that we have seen are elements of a child’s soul. Instead, it draws on fear (of not belonging), hierarchy, and abdication of responsibility. It is my opinion that with adult support to form community, these “Lord of the Flies” societies need not be. No, it is more than my opinion…I am witness and collaborator to just such a thing. 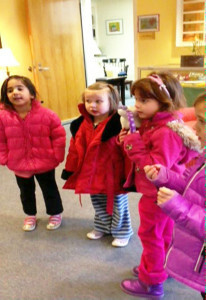 When I taught Kindergarten I noticed that at about five and half years old, the girls began to want to form “clubs.” At best, these were clubs based on interests; at worst, they were based on physical attributes or clothing. 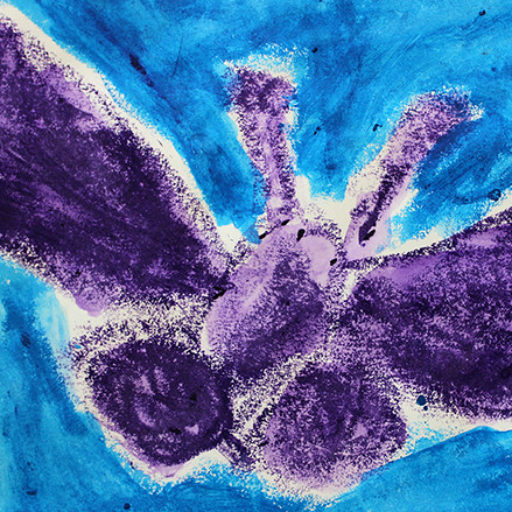 I understood that as part of the cognitive growth spurt they were experiencing, the children were newly able to classify in more sophisticated ways and would begin to be able to consider what something is not as an identifying attribute. In translation to social contexts, that means that in order to belong, one must differentiate between the self, who must belong, and she who will not belong. Therefore…clubs, exclusion, and the making of bullies. When I left Kindergarten to found a new program for children a bit younger, I set out to learn whether a classroom community could be established in which this did not happen…in which all children felt that it is their right to belong, and exclusion was not necessary. Twenty four years later, I look back and see that in many ways we were successful in forming communities of learners in which the children look out for each other, advocate for each other, and have the tools to negotiate when things don’t seem right. But I also see that this one year of intentional community building makes little or no difference in time (and thus, my conversation with an Upper School teacher who is witness to the “mean girl” phenomenon on a regular basis). A failure? Yes and no, I suppose. Could what we do…or something similar…make a difference in the community if it were practiced at every level? In cases where the “mean girl” culture is perpetuated by parents who also grew up in it, can the school make a difference? All I know is, I would surely like to try. I realize that I cannot make a list of “what to do” to build community in the early childhood classroom. It is so deeply woven into everything that we do, every day. So I will give examples of the kinds of changes we’ve made over the years, in hopes that the idea might spread, or readers might be inspired to share with each other what they do to create caring communities, that we all might make a difference in the lives of children. 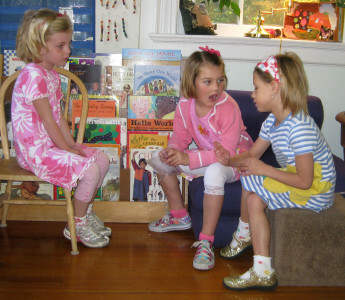 The environment of the classroom is set up to encourage collaboration. Almost every area can accommodate at least two children. 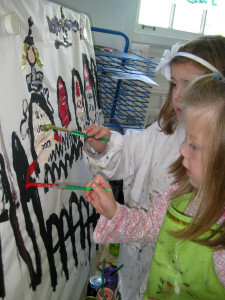 Children must collaborate in order to learn that collaboration is pleasurable and worthwhile. There are no privately owned materials as in some classrooms. The markers are shared, the glue is shared, the pencils are shared. Neither is there privately owned space. That is, we are all responsible for the upkeep of the classroom and all work to make it be a place that is beautiful and “ready for the next person” who wants to use it. We do expect the children to clean up after themselves. But when there is a large mess to clean up (for example, a block structure built by many over the course of many days, but ready to come down), we put on cleanup music, and everyone…including teachers… helps. Often, after a large job, we have a mini celebration. For example, when the children have finished clearing the block platform, they dance on it for a minute or two, a ritual that came from the children. Taking care of the environment can be a moment or an event. Either way, it’s for all of us to do together. At the end of morning meeting, the children declare plans publicly, so that others may know what’s happening and have a chance to join in. This is also a time for children to request collaborators. We help children identify experts in their midst and encourage them to seek each other out for help. And, if someone complains, “She said my dog doesn’t look like a dog!” our response is likely to be, “Did you ask her why? Maybe she can help you make it look even more like a dog.” When children teach children both sides learn, and it enriches the relationship they have with each other. 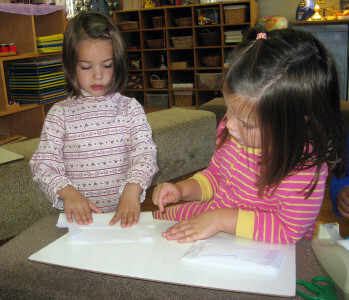 One child teaches another how to make a wallet using paper construction. 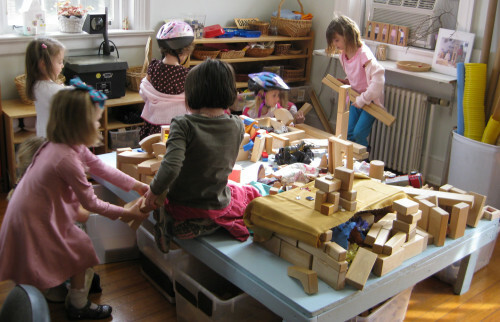 We have a specific protocol (an Adult-Child Interaction Continuum) with which we support children who are having difficulty getting into play, are experiencing conflict in play, or are trying to solve problems in play. The purpose of the continuum is to support children in using language with each other, which includes responding to the language of others, to solve problems in social contexts. To view an article that describes our protocol, click here. When a child is hurt, emotionally or physically, intentionally or unintentionally, by another child or by natural circumstances, we ask the child who did the hurting or witnessed the emotion to ask, “Are you OK?” (Not, you will notice, “I’m sorry,” which ends the interaction and may leave the hurter in shame). If the hurt child says, “Yes,” then they usually resume playing. If she says “No,” then the supporting child asks what her friend needs: a sip of water, a rub on the back, a band-aid or ice pack, an invitation to play, etc. What this does is turn the child toward the one she has hurt. And it gives her a chance to repair the relationship. In acting to make things better, she can often avoid the shame and helplessness that these situations can cause. It gives the child who was hurt attention from the one who hurt her and meaningful actions to fix things. And it makes re-entry into play possible. We teach the children this approach at the beginning of the year. But often, the children take it over in their own way. Whenever anyone cries in our classroom now, children come from wherever they are in the space to see what’s wrong and to take care of it. Adults are always present, physically, mentally, and emotionally. But frequently we are not needed, now that the children are caring for each other. 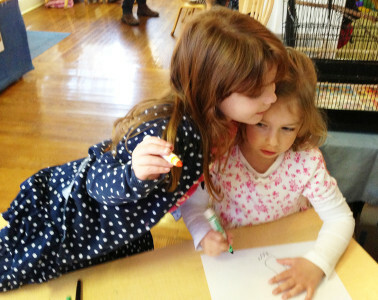 A child consoles another child, who expressed frustration when she was not satisfied with her attempts to draw something. When we are flooded with emotion, we cannot reason, think, or solve problems. Knowing this, we work toward a culture in which it is possible to have cognitive conflict without emotional conflict. For example, the children learn to hear “I disagree” when they pose their theories in conversation, without becoming offended. And, when there arises conflict in play (a common one at this stage of the game is determining the order of play in a game…everyone wants to be first), in order for negotiation to take place, emotions need to be in check. Our “system” is that the children talk until the conflict is resolved and everyone is satisfied. The children know this, and I think that helps them stay with the process. When the girls reach a certain stage, the idea of clubs still emerges. But by then, they have formed such a tight community, that they do not imagine excluding anyone. Rather, the energy around “clubs” seems to be more about getting as many people as possible to “sign up,” and, of course, the sign up sheet itself. This happens year after year. The girls learn to solve problems, including social ones, through negotiation. At the beginning of the year we may see one powerful child declaring that this is how it will be, taking on followers and abandoning the rest. Though we certainly have lots of powerful children and we do see leaders in play, by mid-year we also see children who don’t feel included marching right up to those leaders and asking to play or articulating what they don’t like. We have set an expectation that every child will find and use her voice, and that every other child will listen and respond, even if that response is a counter-argument. And perhaps best of all, I have noticed that as the children form a community, they begin to advocate for themselves and for each other. Sometimes triads develop, which can be difficult for young children to sustain. In one such group, a strong child who had the desire to dominate play became overwhelmed by the desire to also dominate the players. She started to try to draw one of the other two away (so that there would be a more comfortable dyad). I watched the child she was trying to lure away think a bit and then say, “If Sarah can’t go, then I’m not going either,” a clear message to the excluding child, who backed down and said, “Let’s all go,” and play resumed. When we have a school-wide tornado drill, we all crouch in the small windowless front entryway. During one such drill, there was a communications glitch. We heard the alert over walkie-talkie and hunkered down in our tight little spot. 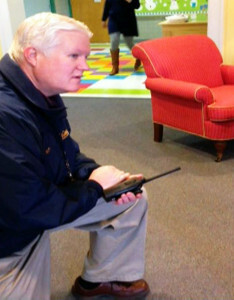 Not knowing about the walkie-talkie alert, a security guard opened the front door a bit and, without looking in, blew an air horn into the hallway to announce the drill. The children were startled and afraid, and some cried. They were comforted and we moved on. But a few of the children who had cried continued to talk about how the guard should have looked and shouldn’t have blown it inside but outside and so on. Finally, I asked if they would like to have a talk with Mr. B., the head of security. “Yes,” they said. Three who had cried decided to go, and one who had not but wanted to support her friends went as well. When the children met with the head of security, whom they know well, they told him that some children had cried when the horn blew, and asked that it not happen again. Mr. B. tried to solve the problem by explaining why the horn blew, but the children would have none of it. They insisted that he negotiate with them. In the end, everyone agreed that it would be all right if the horn blew outside the building, where we could hear it but it would not frighten children. It’s messy and sometimes it takes a while to resolve conflicts or hammer out a solution to a problem. But when I see the children so competent in play, conversation, problem solving, and negotiation at ages four and five, I know it is well worth the investment. Wouldn’t it be a wonder if first graders and third graders and tenth graders could do it, too?